Sunday February 2nd 1879 It was so late when we got up this morning and there was so much to do that I could not go to church in the morning. I wrote a letter to Cousin Ira and Charlie Brown in the afternoon Eddie went to church with me in the evening. 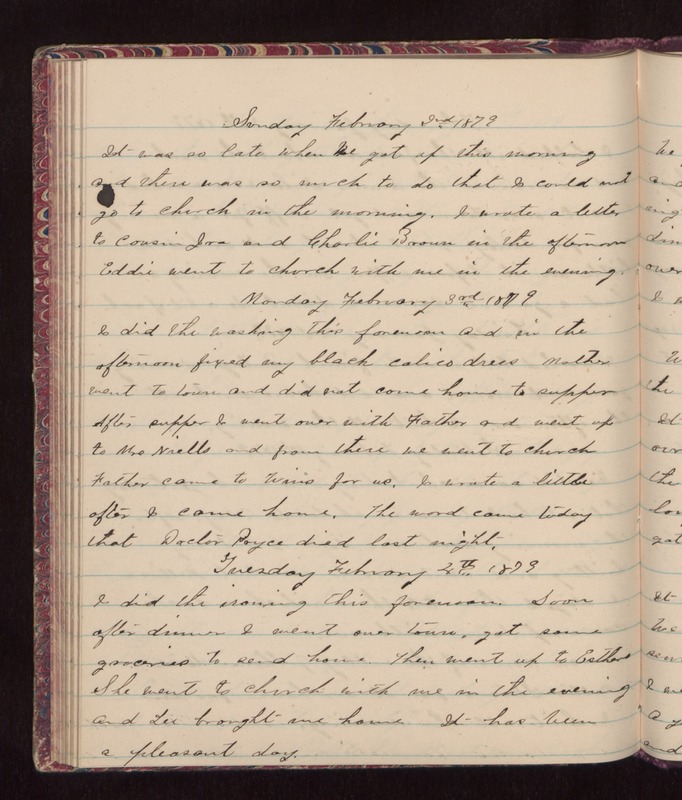 Monday February 3rd 1879 I did the washing this forenoon and in the afternoon fixed my black calico dress Mother went to town and did not come home to supper After supper I went over with Father and went up to Mrs Niells and from there we went to church Father came to Wins for us. I wrote a little after I came home. The word came today that Doctor Payce died last night. Tuesday February 4th 1879 I did the ironing this forenoon. Soon after dinner I went over town, got some groceries to send home, then went up to Esthers She went to church with me in the evening and Lee brought me home. It has been a pleasant day.